As the most powerful and advanced Class IV therapeutic laser, the FDA-cleared K-Laser is a thousand times stronger than the previous one that we used here in the practice. The potency of this laser brings deep penetrating heat into the tissue and causes vasodilation to transport more blood into the injured or inflamed area. This therapy is an excellent alternative to surgery. As a four-wavelength laser, the K-laser is unique. Three of the four wavelengths of light are infrared (the other is red) and therefore can penetrate deeper into the body for effective healing. 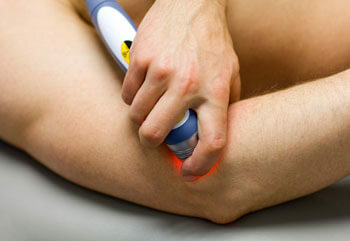 Patients who receive laser therapy can experience increased circulation, decreased pain, accelerated healing and more. Those who have had surgery also respond well to this therapy, particularly if they’ve had spinal surgery. Thanks to K-laser therapy, many people can avoid a second spinal surgery. Athletes also can recover quicker from their sports-related injuries. If you’ve tried everything under the sun, including chiropractic, for your pain, consider K-Laser Therapy. We have many patients who have experienced its incredible healing benefits. One patient who had carotid artery surgery wasn’t able to have his neck adjusted, but the K-Laser was helpful for him. A police officer who had twisted his ankle so bad that he caused an avulsion fracture (where the tendon tears the bone off) could barely walk through our door. After we used the K-Laser on him, he was able to walk out without a limp. After just three treatments he was able to return to work. He thought he’d be out a month. If you’d like to experience for yourself how this treatment could help you feel better and get better, contact ProWellness Chiropractic today!